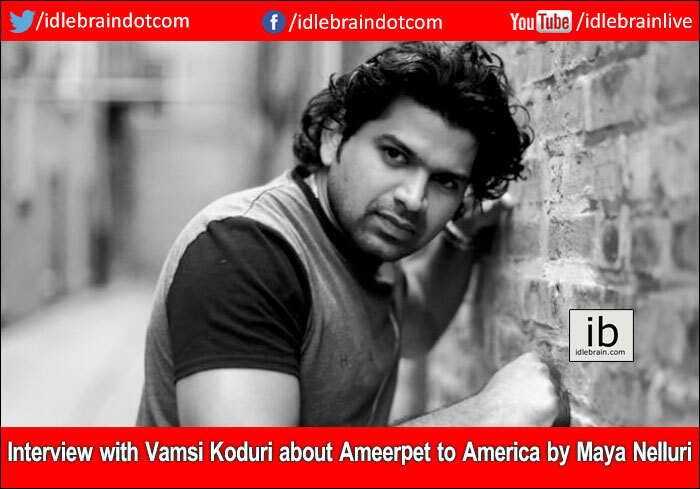 Vamsi Koduri, a protagonist of the film Ameerpet to America (A2A) speaks to Idlebrain about his entry into Tollywood. He has a vast experience in the world of short films and is now excited to have his name added to the multitude of silver screen stars. When did u move to the US? I moved 13 years ago. I actually came here for a job but I ended up pursuing my MBA. Ever since then I’ve been working in IT as a project manager. Were you interested in films before you left India or did it come about afterwards? When did you start working on your acting? Between my Diploma and Masters I did my portfolio. It took close to two years to achieve anything solid back then. There was a lot of societal pressure and I also put a lot of pressure on myself. I ended up pursuing my Engineering and landed in the US. But my passion for cinema never died. I did a number of short films within my group of family and friends. Then external projects also started to happen for me. There was one in particular which I did for the New York Film Academy at Harvard Massachusetts and another for the School of Art at the Institute of Chicago. Recently I co-wrote, co-produced and acted as a lead in the short film List which was my best work to date. It was not only nominated in several American film festivals but also won several accolades. How did Ameerpet to America happen? I spent a number of years doing short films but my main goal was always to see myself on the big screen. I had sent in my auditions for everything from Hollywood, Bollywood, and Tollywood for years. Finally tinsel town heard me and a guy in Dallas called Ram Mohan auditioned and selected me. I will just take it as it comes. I’m open to any roles that come my way. I haven’t yet considered moving out of America because that is a big decision but I’m keeping all my options open. As for lead or other roles, I consider myself an actor. In A2A I’m the second lead with a prominent character. I’m happy to do any role with substance. Tell us about the movie A2A. It is basically about a group of enthusiastic students from Ameerpet who want to pursue their masters in the US. It includes various elements from each of the character’s lives. There are funny experiences, instances inspired from the struggles of students in the US. There are also strong emotions; we touch on racism, friendship, love. It all culminates into an emotional climax.